Kaab, A., R. Frauenfelder, I. Roer (2007). "On the response of rockglacier creep to surface temperature rise." Global and Planetary Change 56: 172-187. This paper is about ice-debris mixtures under mountain permafrost conditions called “rockglaciers” that form “creep streams”. These creep with surface speeds of a few centimeters to several meters per year and are thousands to ten-thousands years old. The study focuses on addressing how rock glacier creep rate responds to changes in surface temperatures using globally observed rockglacier speeds. They find that many rockglaciers have increased in speed in recent years and that ones with ground temps closer to 0C creep faster. They conclude that increasing rockglacier temps will lead to a spatially and temporally speed up before enough melt occurs to reduce the deformation rate of the frozen mass towards it’s “deactivation”. -Rock glaciers are important geo-indicators for mountain permafrost and related paleo-climatic conditions. -The deformation magnitude of rockglaciers can change on multiple temporal scales. oMillenia scale show origin of the rockglacier and stages of it’s transport system. oCentury or decadal scale speed variations can indicate topographical changes, water/ice supply changes, or thermal regime changes. oAt the Pluriannual time scale geodetic studies have shown velocity changes may be a result of variations in weather or climate conditions. oSeasonal variations in creep speed are due to internal conditions of the rockglaciers in response to external climate forcing. -Deformation increases with increasing ground temp. -In their numerical model they neglect both water penetration, advective mechanisms of heat transport, and the geothermal heat flux. These seem very important to the analysis… how could they be confident with their results when they’ve neglected such key processes just because there is not sufficient knowledge about their effects… seems like a big hole in the study. -There seems to exist an exponential-like dependency of deformation from temp. -The study refers to the importance of the “soft layer” and it’s vertical position but I’m not sure what they mean by this. Speed variations seem to depend on the depth of this soft layer. -The time it takes for the columns to adjust is 5-7 years for 15m and 15-25 for 30m… indicating that rockglacier speeds haven’t yet adjusted to today’s warmer temps. -There are many factors that determine rock glacier speed not considered in this study so they might not actually reach their “potential” max speed as shown in this study. -The next part of the study examins rock glaciers in the Swiss Alps since 1970. -In the Swiss Alps “stop-and-go” events of creep speed were observed with magnitudes ranging from less than .2 meter to over a meter a year. These were observed with photogrammetry. -Rockglacier speed is delayed by ~2 months compared to surface melt-out of snow. Delay of speed up after meltwater penetration into ground is 3-4 months. -In one study the movement of 30 blocks were measured since 1998 and it was found that the blocks on the northern slopes moved up to 1m annually while the ones on the western slope only displaced a few cm annually – possibly due to solifluction features in the area (solar radiation differences I assume). -What does it mean when a paper says a glacier has “collapsed”. What has physically happened to it? What are “destabilized zones”? -Seasonal surface temp variations are expected to cause speed variations up to 15% depending significantly on the average ice temp. -Speed variations of 10-50% can be expected for pluriannual temp changes due to lower thermal attenuation. -The warmer the ice, the larger the variations of surface speed due to changes in surface temp. -Depth of the “soft layer” can amplify or compensate for changes in surface temp effecting speed. -Surface temp variations can cause significant spatio-temporal variations in rockglacier mass fluxes at different slopes (higher slope = faster). -At the end of the study they admit to altering several parameters but say the conclusions due not change substantially. In a professional paper how do you know when to say such things? Isn’t that a matter of opinion? -Rockglaciers in warmer conditions (lower in elevation near lower limit of permafrost close to 0C) react more sensitively to ground temperature changes from air-temp or precip changes than colder ones – This is applicable to my study and is a concern for geotechnical aspects of debris flow hazards. -Some great geotechnical hazard associations listed on the last page of the paper such as rock transport, landslide potential, speeds, etc that could be referenced in my studies in relation to debris flow initiation sites perhaps. Arenson, L.U., 2002. Unstable Alpine permafrost: a potential important natural hazard — Variations of geotechnical behaviour with time and temperature. PhD Thesis, Institute for Geotechnical Engineering, ETH Zurich. Barsch, D., 1996. Rockglaciers. Indicators for the Present and Former Geoecology in High Mountain Environments. Springer, Berlin. Davies, M.C.R., Hamza, O., Harris, C., 2001. The effect of rise in mean annual temperature on the stability of rock slopes containing ice-filled discontinuities. Permafrost and Periglacial Processes 12 (1), 137–144. Haeberli, W., 1992a. Construction, environmental problems and natural hazards in periglacial mountain belts. Permafrost and Periglacial Processes 3 (2), 111–124. Haeberli, W., 1992b. Possible effects of climatic change on the evolution of Alpine permafrost. In: Boer, M., Koster, E. (Eds. ), Greenhouse-impact on cold-climate ecosystems and landscapes. Catena Supplement, vol. 22, pp. 23–35. Haeberli, W., 2000. Modern research perspectives relating to permafrost creep and rock glaciers. Permafrost and Periglacial Processes 11, 290–293. Haeberli, W., Wegmann, M., Vonder Mühll, D., 1997. Slope stability problems related to glacier shrinkage and permafrost degradation in the Alps. Eclogae Geologicae Helvetiae 90, 407–414. Humlum, O., 1998. The climatic significance of rock glaciers. Permafrost and Periglacial Processes 9 (4), 375–395. Kääb, A., 2000. Photogrammetry for early recognition of high mountain hazards: new techniques and applications. Physics andC hemistry of the Earth. Part B: Hydrology, Oceans and Atmosphere 25 (9), 765–770. Kääb, A., 2005. Remote sensing of mountain glaciers and permafrost creep. Physical Geography Series, vol. 48. Department of Geography, University of Zurich. Kääb,A.,Vollmer, M., 2000. Surface geometry, thickness changes and flow fields on creepingmountain permafrost: automatic extraction by digital image analysis. Permafrost and Periglacial Processes 11 (4), 315–326. Kääb, A., Haeberli, W., Gudmundsson, G.H., 1997. 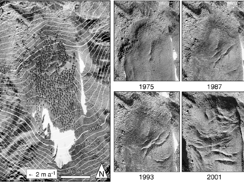 Analysing the creep of mountain permafrost using high precision aerial photogrammetry: 25 years of monitoring Gruben rock glacier, Swiss Alps. Permafrost and Periglacial Processes 8 (4), 409–426. Reasoner, M.A. (Eds. ), Global Change and Mountain Regions (A State of Knowledge Overview). Springer, Dordrecht, pp. 225–234. Roer, I., Avian, M., Delaloye, R., Lambiel, C., Dousse, J.-P., Bodin, X., Thibert, E., Kääb, A., Kaufmann, V., Damm, B., Langer, M., 2005a. Rock glacier “speed-up” throughout European Alps — a climatic signal? 2nd European Conference on Permafrost, Potsdam, Germany. Terra Nostra, vol. 2005/2. GeoUnion Alfred–Wegener–Stiftung, Berlin, pp. 99–100. Strozzi, T., Kääb, A., Frauenfelder, R., 2004. Detecting and quantifying mountain permafrost creep from in-situ, airborne and spaceborne remote sensing methods. International Journal of Remote Sensing 25 (15), 2919–2931.